Thanks to a few current threads on acid automation I am doing some research on adding a acid dosing setup for my pool. 1. Chose one of the small fixed rate Stenner Pumps - currently looking at the Econ model: E10FLA. (pump rate 58 oz per hour). 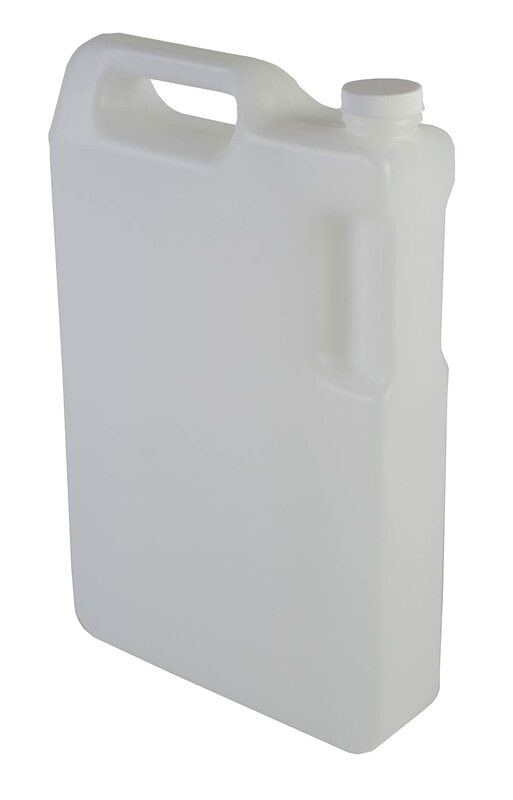 Being able to thread a new 1 gallon jug onto the system would be really easy and I could see when it was getting low - for my minimal needs it would be more convenient for me. So is this a totally crazy idea? 3. Wiring to my Aqualink RS Control Box. I have extra relays available. When it is properly hooked up I would program the Stenner pump via one of those relays (naming it Acid Pump in the automation program), this would turn on power to the Stenner for just 1 or 2 minutes every day...giving me 1-2 oz of acid per day. Wiring shouldn't be too difficult and I could probably even wire it with the pump motor as safety check (I have seen this suggested on some other threads for Pentair systems). My control panel is pretty similar. I will look at the wiring at a later time when/if I can figure the rest of this out. You'd want to make sure the jug was secure, so that it couldn't be knocked over, stepped on, punctured or accessed by children. Should be out of the sun, too. You could put it into something that could accomplish all that, bolt that to the pad, lock it up, etc. Leaving it just sitting on the pad doesn't sound good to me. The jug will need to vent, to take in air as it dispenses, and to accommodate expanding and contracting in the various temps it'll be subjected to on the pad, especially as it becomes less full (more air). That venting will leech acid fumes, which can affect the metal of surrounding equipment. You'll need to deal with that somehow. My system is airtight except for a small air vent which can be connected to a tube. I ran the other end of the tube well away from my equipment pad. The end of the suction tube should have a filter on it. I'm not sure why, I just know mine does. I guess there can be impurities in the acid? And you want to keep those out of the pump? That's probably more of an issue when using a tank, and not so much when pulling right out of a new jug. It's a minor consideration. It's an interesting idea, be sure and keep us posted with what you come up with, and how it all works, for others that might want to try it. I have a pretty secure/hard to access equipment area that is recessed behind a big retaining wall - so it isn't somewhere a child would get to without major contortions. That being said safety is always important to keep in mind. I am thinking I could easily have a hardware setup that secured the handle of the acid jug to my concrete retaining wall without too much trouble. There is lots of airflow in this area and it is shaded as well so it is a good place to put the tank or jug. I would love to just plop the jug down. I was told the typical acid jug already vents. Which I admit is a bit confusing, since the acid I buy is sealed under the cap. Maybe they vent after the seal is removed? This was in the context of someone describing how they ruined everything in their garage, from corrosion, only to find out the culprit was the MA jug they were storing inside. Apparently closed up tight. Sorry, a little vague. But the jug you want to use will have to vent, and anything near it is subject to corrosion. I don't know how much circulation is needed to negate that issue. According to one Stenner owner I was discussing this issue with (did you see that thread? ), he describes the tank he's got as having no dedicated vent. He thinks it vents through the filler opening. I haven't gotten to the bottom of all this. And am not trying to too hard. My tank has a vent and I can direct where it vents to, so I'm yapping about it more than I am researching it! If I can't fit the two directly onto an existing cap, then I am thinking I could drill out the cap to fit a larger threaded PVC fitting connected to a PVC T or Y. Then I would have two PVC ports/connections for the suction tube and for the vent. The cap on the Stenner tank (that I was asking the other TFPer about), had no seal, which is why he thought that was the venting mechanism. The cap on an IpH has an o-ring, which is how I know the whole tank is airtight, except for the vent. That's how Pentair is controlling the fumes. So for your rig, you might need to replace the cap your jugs come with (if it does, in fact, vent) with one that can seal well enough to the jug. Then add your PVC gizmo to that one. What’s wrong with using a tank? You can put the tank on rocks, dirt, cheap $1 pavers from Home Depot. A tank will give you months of acid automation (it doesn’t degrade) and is more secure. I think he wanted to simplify the handling of the jugs. But I'm kinda with you. One of the nice things about my acid doser is that I don't have to deal with acid for four gallons at a time. That's months. When it comes time, I saddle up in my protective gear (gloves, goggles and mask) and just dump a few gallons in all at once, through a big opening in the tank. Quick and easy, then done with it for months. santacruzpool - (see how quickly I turned on you!! ) It's something to maybe reconsider. Pouring the acid into a bigger tank is not all that bad, and with your cap idea, with the little tubes coming out of it... you might have to disconnect tubes to get the cap to spin off, or what, turn the jug under the cap? And then there is the tube that runs down into the gallon jug, which will be dripping acid as you withdraw it, hopefully not flicking it onto your leg at the same time. And then maybe draining acid as you lay it aside to ready and position the next jug, which could put air into the tube, which will affect at least the first dosing... etc, etc. With the tank, the tube is apart from the filler hole and lid. Unscrew lid, pour, replace lid, toss gallon jugs. Done. Do some good visualization for each option and to picture what's what. Last time I did it, it worked great. I had two gallons, one in each hand, one acid, one water. I poured them into the tank together, at the same time, mixing mid-stream, and created my 1:1 dilution mix on the fly, out of 31% acid (which is quite a bit cheaper where I live that two 14% gallons). I can't necessarily endorse and recommend that MO, but it worked. I'll try it again the next few times and judge how safe that is. But with all the gear I wear not too much can go wrong. I don't really have room for 7.5 gal tank - especially where I want to put it. I may change my mind but that is why I am asking questions first to see if there is a big problem I haven't yet foreseen. On my Stenner chlorine setup - I just drilled a hole in the cap of the 5 gallon carboy which the chlorine comes in and threaded the feed tube through it. The hole is not completely airtight to the tube so allows enough venting to keep up with the low flow rate. When the carboy is empty just switch it out amd keep the same cap - which is the same as what Santa Cruz has in mind. Also no need to worry about sediment buildup with this as the carboy is constantly being replaced. as long as u can drill through the MA cap without issue it should work fine. Is your pad inside or outdoors. If outdoors is corrosion from fumes really an issue? I would see fumes outside dissipating real quickly unless maybe your pump is immediately next to the jug. I’ve stored small amounts of MA in my garage for the last year as I don’t have a safer place for it. Its probably 15 feet from any real equipment but there are bits of metal closer (brackets on shelves, light switch covers etc). I haven’t noticed any unusual corrosion yet and I have been looking. Right, you did say you had a space issue. I "spaced" that out. So you could use the hopper I have (and really like) and the Stenner pump, or use the Pentair pump which bolts to the Pentair hopper. The base of the tank is about 14" square. The motor/pump protrudes about 4" beyond that. I could go measure exactly if you need. Pentair did some good engineering regarding filling. The fill lid is big, bigger than a gallon jug. You remove the lid and you turn your acid jug upside down, with the seal still in place, and insert the jug into the top portion of the tank, lowering it down aligns the seal with a spike which punctures the seal, and acid then dumps into the tank. Very slick. You can puncture the jug while inserted to allow air in to speed the pour, or just let it glug-glug in. I believe the Pentair tank is superior to the Stenner offering for the above reasons, and its relatively small. Which has it's own "advantage" beyond the space needed for it. I was discussing this elsewhere here. I dilute 31% 1:1, so at any given time I don't have more that about 1.5 gallons of 31% loaded. Should my acid dosing go haywire and somehow empty the whole volume into my pool, I was told that that amount of acid would have no ill effects on people or pool, which was comforting. Even the wildest malfunction will not cause harm. 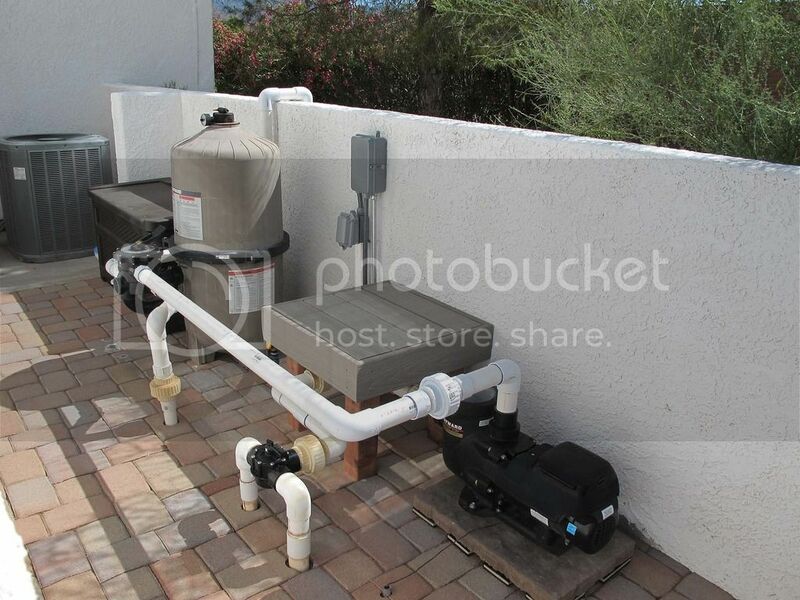 My pool would need about 16 gallons of MA for a no-drain acid wash, so others here that use a huge tank and fill it full might not be able to make such a claim. Of course you can always add less than full capacity, but then you're taking up space on your pad for nothing. The IntellipH tank is perfect for my application for multiple reasons. Perhaps its crazy price would make sense for you, too. Get IntelliPH working without InteliChlor? Yes, I looked at the thread you posted - it has some good information. Dirk, your tank, while smaller than 7.5 gal., might be a bit too big. I will have to look at my pad with fresh eyes this weekend. I have also read another older thread talking about how the Pentair pump motors needed to be replaced annually due to acid corrosion (apparently this applied to units made prior to 2014 - according to the current Pentair installation docs). Since they are mounted on the tank differently than the Stenner setup I wonder what the life of the latest pump will be now - just replacing the tube yearly is no big deal. Would be great to see a picture of your equip. pad, if possible. Stenner tanks have a diameter of about 22". There are slimmer tanks (generic) that are available also. If you are really tight on space, you could secure the tank to a table-like structure that straddles the pool equip. Would be OK if the tank is secured. Here is an example of what one member did. Slimmer tank that is raised. Looks like I have about a 19"-20" square area? 5 gal carboy would probably work great. Width-9.75" x Length-10.5" x Height-15"
Lacking in room, not ideas!